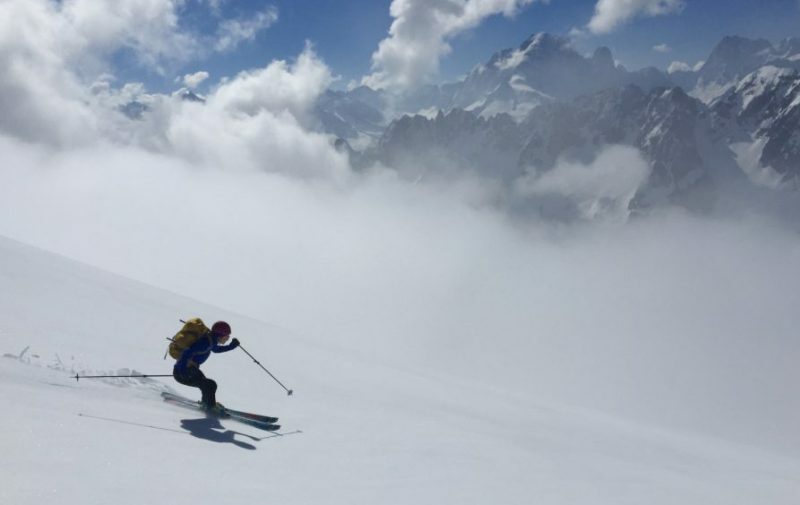 Chamonix is a world mecca as a base for ski mountaineering and this 4 or 2 day course gives you the opportunity to sample a superb variety of challenging mountain ski journeys. By making use of Chamonix’s famous high altitude lifts, spectacular glacier routes can be completed as day tours from the valley. We also aim to visit some quieter, less well known parts of the Italian Valle d’Aoste or Swiss Rhone Valley, both easily accessible from Chamonix. 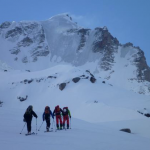 This course includes an overnight stay in a mountain hut in order to access a higher summit or col. 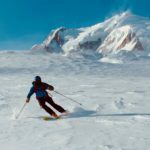 It is designed for folk with some existing ski touring experience and a good level of fitness, wanting to do some more technically & physically challenging tours. 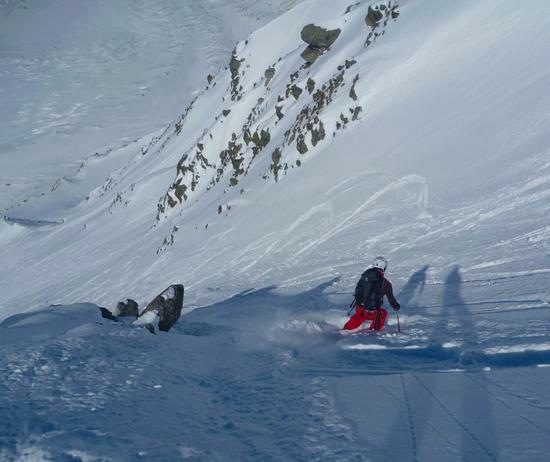 Complete some fine medium to long ski mountain journeys in the Chamonix Valley / Mont Blanc Massif & surrounding area. Find great snow & terrain to enjoy some excellent high mountain skiing. 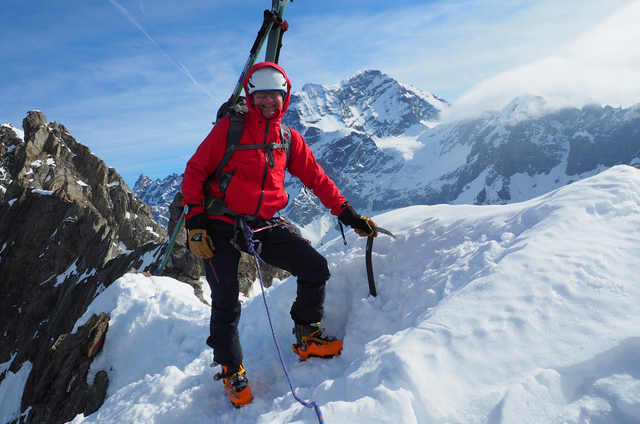 Use mountaineering equipment efficiently to allow for more technical ski objectives. 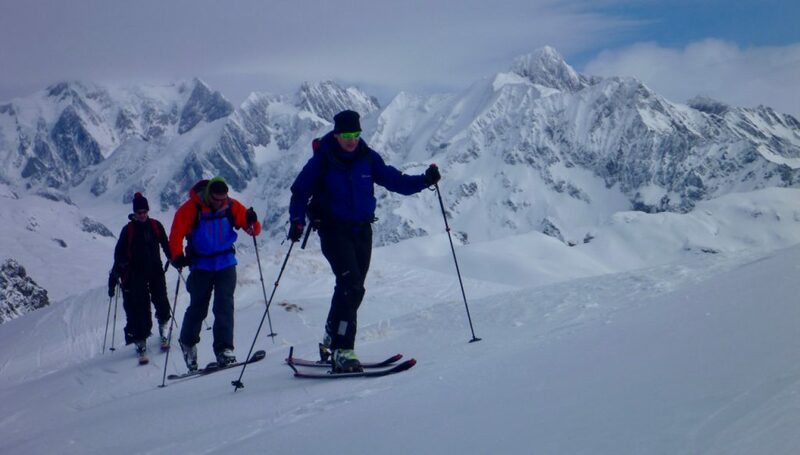 Refresh ski touring skills with some good ‘on the go’ training. Spend a night in a mountain hut thus enabling an early start to complete a longer tour. 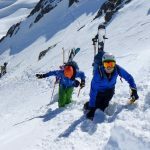 Provide an excellent sound springboard, at the start of the classic hut to hut touring season, for other challenging ski mountaineering trips in the spring. Have an enjoyable and sociable week meeting up with other like minded ski mountaineers who you may end up skiing with again in the future. 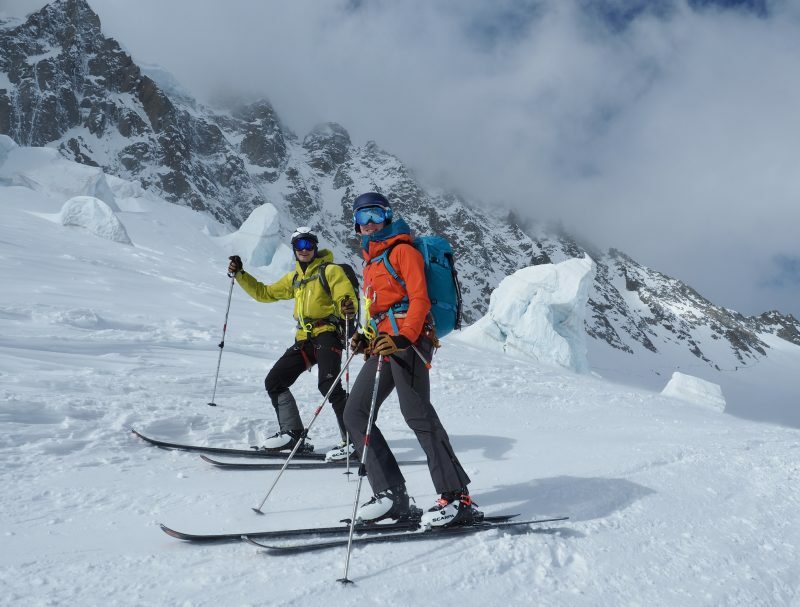 From our base in the Chamonix valley we use a mixture of both the extensive range of lifts and high mountain roads to access a variety of styles of ski mountaineering terrain. After an initial warm up and training refresher, the focus of the week will be on completing some great mountain ski journeys. 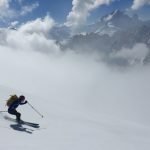 Superb powder descent of the Vallee Blanche – training both off piste technique and glacier skiing principles at the same time as part of a big days ski mountaineering in the Mont Blanc Massif. Pre-Course. As with all our ski courses, we recommend you prepare as much as possible in advance with relevant ‘ski fit’ preparation and then arrive at least a day or two early to both warm up your ski legs & check equipment. This is especially important if you will be renting boots or skis & bindings. Please also make sure your skis are well serviced & bindings correctly adjusted. Day 1. Introduction to the week ahead and kit check (see note 1* below). 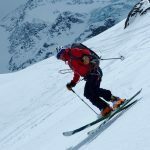 Brief revision of ski mountaineering skills and complete some ‘micro-ski-tours’ out of one of the Chamonix resorts e.g. various interesting skinning journeys from ‘Le Tour’. 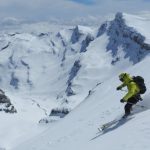 Opportunities to refresh skinning technique & Kick turns, avalanche emergency procedures and some basic mountaineering elements. Day 2. 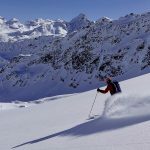 A full day tour with the aim of skiiing a substantial peak like Mont Buet (3096m) in the Agiuilles Rouges or Mont Colmet (3024m) in the Valle d’Aoste. Days 3 & 4. 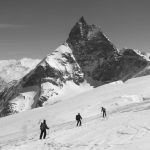 Ski journey with overnight stay in a Mountain Hut, see below for various suggestions. The exact itinerary will be arranged close to the time according to weather and snow conditions. Fresh tracks in velvet powder at Pila above Aosta. Bonatti Hut. 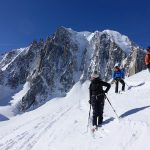 A tour can be completed in the Italian Valle d’Aoste, such as Mont Colmet, followed by an evening skin in to this superb hut which provides a fine base for further touring in the Val Feret on the Italian side of the Mont Blanc Massif. Ski mountaineering traverse of Les Domes de Miage en route to Ski the Glacier d’Armancette, Les Contamines Valley on the West side of the Mont Blanc Range. 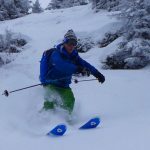 In addition to the main 5 day course we also run a 3 day mid-week course at the start of the season as a great refresher base for folk going on to do more ski touring later in the season. This can be an enjoyable time to be touring, often with an enjoyable blend of elements from the close of the winter to the arrival of spring. 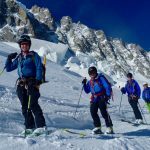 This course completes one day tour / ski mountaineering training day from a base in Chamonix before setting off on a 2 day expedition with a night in a mountain hut. It has the same objectives as the 5 day course and aims to make the most of 3 action packed days in the mountains. A very good level of general & mountain fitness is required to complete some of these longer tours (an ability to comfortably maintain an ascent rate of 300m+ / hr on skins for up to 5 hours). Very effective off-piste skiing is also required. This means the ability to make controlled & accurate linked short radius turns in a variety of steep off-piste snow conditions. 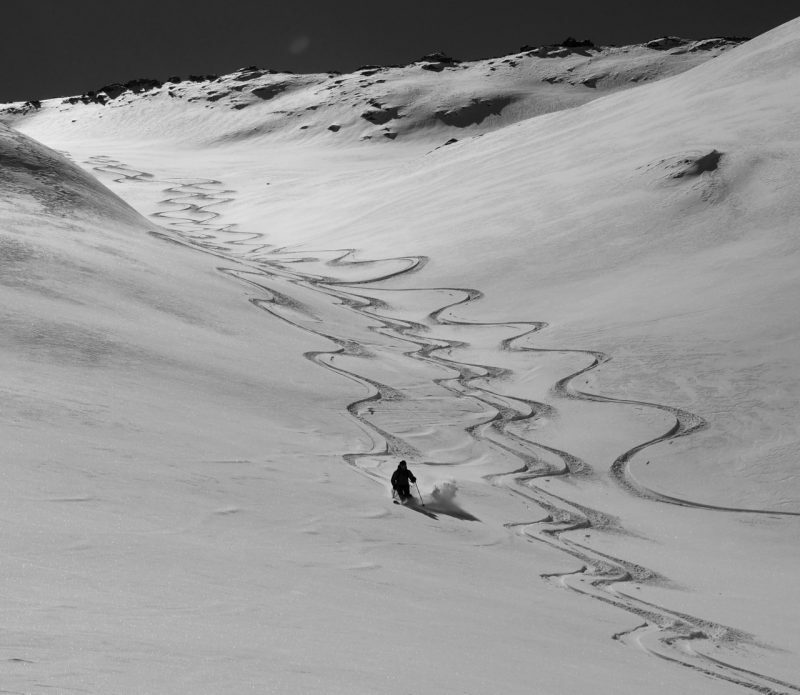 Some previous ski touring experience is also required as well as a strong & reliable ‘kick-turn’. If you don’t have these please check out our introduction to ski mountaineering course first. 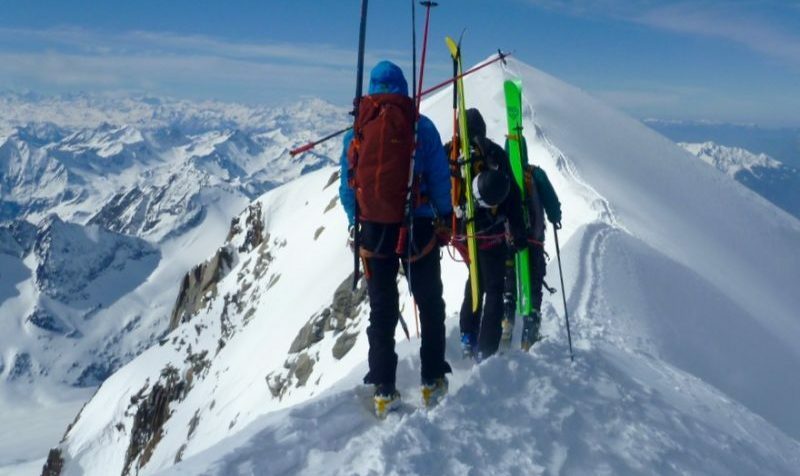 4 full days ski mountaineering & off-piste skiing with an IFMGA Mountain Guide. Course planning & booking of mountain hut etc. *Please note that the detailed kit list, given via the link below should be followed and all hire kit including boots, skis, skins, ski crampons, poles, transceiver, shovel, probe should ideally be collected in advance of Day 1, so that a swift start to the course can be made. You can arrange with us in advance to hire shovel, probe & transceiver for a considerably cheaper rate than in the shops. Lift passes. As we will ski at the most appropriate venue for the day, depending on the weather and snow, we ask you to leave buying your ski pass until the first morning of the course. We have found that the discounts for buying multiple days are small but the losses if you do not use them are significant. Thus we prefer to retain flexibillity to ski outside the area covered by certain passes. Cost of an unlimited day pass in Chamonix is C.60 Euros and any other venues we use will be cheaper than this, down to around 20 euros for a ‘forfait rando’ or free if we are skinning from the car! Please note that we can provide this course for small groups or individuals on a private basis. Please contact us to discuss dates.